The U.S. Postal Service (USPS) has many post offices in the Phoenix area, but the main USPS postal facility is in Phoenix at 50th Street and Van Buren near Downtown Phoenix. Many people have the impression that the main post office in Phoenix is located on Central Avenue in Downtown Phoenix. While the Federal Building at 522 N. Central Post Office is a large building of historical significance, it is not technically the main post office. The facility on Van Buren handles many more services than other lost offices, including bulk mail and passport photos. The Phoenix Main Post Office on Van Buren is also the only Phoenix post office that is regularly open after 6 p.m. and on Saturdays. Are you mailing your tax return on the last day? Do you need some legal papers postmarked by a certain date, it is 8 p.m. and today is that date? This post office is probably your destination! The customer service window is on the Van Buren Street side, just east of 48th Street. See a photo of this post office. From the east or west, take the Loop 202 Red Mountain Freeway to Exit 4, Van Buren, and drive west on Van Buren to the Post Office. From the south, take I-10 West to SR 143 Hohokam Expressway, Exit 153. Take SR 143 to Exit 4, Washington Street. Turn right (east on Washington to 48th Street, then left (north to Van Buren. 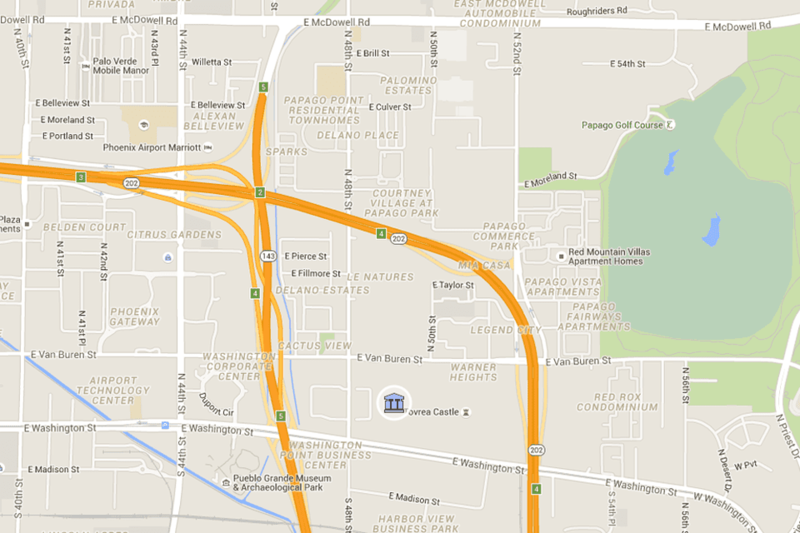 Tip: When driving to the Loop 202 make sure you take the 202 Red Mountain, not the 202 SanTan. Here is additional information about that confusing driving issue. There is a METRO light rail station within walking distance (less than one mile) to this Post Office. Use the 44th Street/Washington station. Here is a map of the METRO light rail stations. If you are simply looking for the nearest U.S. Post Office to your current location, you can do that by using the USPS.com location provider. There you can simply enter your address or zip code and find post offices, as well as other businesses nearby that can provide postal services (often without the long lines). You can access the map on Google Maps, zoom in and out and get directions from your current location.